When Caleb died, I couldn’t accept that he was simply gone and would be forgotten or his memory cast aside. Jackson, Grace and Reagan were so little when we lost them, that they weren’t tangible to anyone but my husband and I (not even my husband, some days). When Caleb died at full term I did a few things to ensure that people would realize that he was a person who died- not simply an “idea” as people tend to treat our first three babies. We asked our family and friends to visit us in the hospital and meet Caleb; we have dozens of photos and videos of the people we love most holding him, singing to him and reading to him. We all made memories in the midst of our brokenness and raw grief. We opted for an open casket because I wanted everyone who attended his funeral to look at him… to see him in the flesh so they would remember him long after he was buried. At his funeral we had bracelets made for everyone to take and wear if they so chose or keep in remembrance of our sweet baby boy. We did these things to create lasting impressions and memories of Caleb for other people as we lived in fear that he would be forgotten by them – not by us. Everyone grieves, heals and integrates the loss of their baby into their lives, differently. 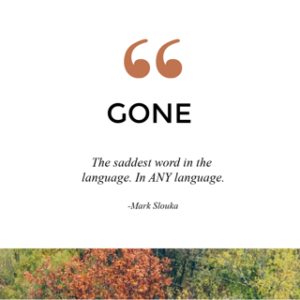 Grief looks different for everyone and can be judgement by other people as to what all things grief/mourning looks like and how it “should” be done. One of my favorite authors, Rachel Hollis, always says “Other people’s opinions are none of your business.” Truer words have never been spoken, y’all. Incorporating our babies into our every day lives took some time to work through; to figure out what worked for us so that we felt them near but also not indefinitely paralyzed with grief. The things that we do to honor them, remember them and keep them near took time to figure out and get to a place where they feel completely normalized and comfortable. These aren’t for everyone but, for us, this is how we keep our babies’ memories alive and well in our family. We celebrate our babies’ birthdays in a variety of ways, depending on the child. We didn’t know when we lost Jackson, Grace and Reagan that we were allowed to celebrate them. We were allowed to remember them and honor them. So we were a little late to that party, so to speak, on doing things to remember them outside of feeling heavy and sorrowful on their angelversary dates. Jackson always gets doughnuts for his angelverary because I imagine him to be a rough and tumble boy who is constantly hounding me for junk food. We bring doughnuts to the cemetery as a family to celebrate him some years, and some years we celebrate at home and put candles in them. For Grace, we celebrate with cupcakes because I imagine her to be a girly girl who loves tea parties and pretty dresses and my child that would cooperate with my desperate need to bow train – a fine southern tradition. Reagan would be my tomboy, much like my little sister when we were growing up. We celebrate her with strawberry milkshakes because I feel like she would be in the middle of a soccer game when I’m trying to celebrate her birthday and she wouldn’t have time for any of that nonsense so milk shakes are an on the go celebration. And Caleb, the youngest, gets a birthday party because I imagine him feeling left out as the youngest one, trying to keep up with his siblings in an attempt to be just like them. 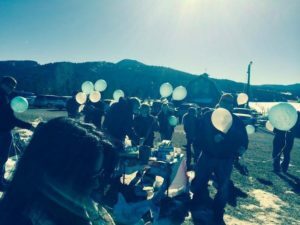 We have a different theme each year up at his place in the mountains and our family and friends gather to drink hot chocolate, eat themed snacks and do a balloon release. It’s lovely and something I look forward to each year. There is a wonderful organization called Molly Bears that creates weighted teddy bears to ease the aching arms for parents who have lost a baby. (www.mollybearsw.org) We received our Caleb bear, as we call him, in 2012 and he has become one of two representatives of Caleb in family pictures and comes along when we travel. 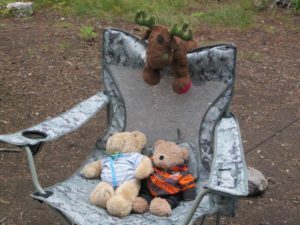 Sure, we’ve been asked why we are taking photos with a teddy bear and a moose by people who were not at all prepared by our answer, but we love having a tangible reminder of our babies to accompany us on life’s adventures. Our Caleb Moose was purchased before Caleb was born in my husband’s hometown in Iowa. When Caleb died, he was buried with his moose and we bought another one for us to keep, one for each of our family’s households and, eventually, gave a small version of him to each of our friends who had babies after Caleb died. Caleb moose accompanies us on trips as well and usually sits on the dashboard, leading the way on our next adventure. We are obnoxious people when it comes to snow. Seriously. My co-workers hate me come winter time because while they’re all cold and complaining about snow, I’m giddy as a child on Christmas morning. This is not something I hide well. I’m like Buddy from the movie Elf- I’m a lot to take on snow days. (#sorrynotsorry) For years my husband and I have had this thing where we try to be the first to let the other know that it’s snowing – we just love snow. We live in Colorado for a reason! 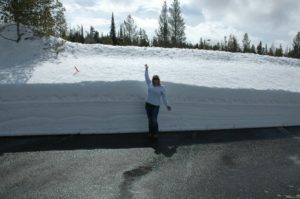 However snow became more meaningful for us after Caleb died because on the day of his funeral, there was a blizzard here and we ended up burying him under 19 inches of snow! The pureness and sheer beauty of the snowflakes literally wrapped around us as we grappled with the impossibility of saying goodbye to Caleb. Now, when it snows, we say it’s Caleb paying us a visit and it brings us an unbelievable amount of joy. It’s a lovely reminder of our sweet boy all winter long. For several years I was a facilitator of an amazing organization called The MISS Foundation (www.missfoundation.org) here in Denver. It’s the organization I referenced in a previous post about one of the things that saved me in the beginning of my grief journey after Caleb died. At the start of each group, we would set the tone for our time together by lighting five candles that represented our grief, our memories, our love, our courage and our hope. I loved the ritual so much that we began to use it within our family for holidays as a reminder of those who are missing from our table. 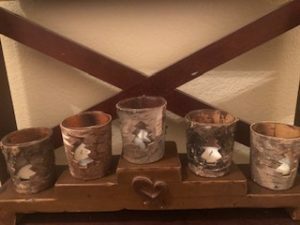 It doesn’t matter what holiday it is, when our extended family gathers to celebrate it, the 5 candle Memorial is read, the candles lit, and a moment of silent is had to honor our four babies who live in Heaven. We don’t have photos of Jackson, Grace and Reagan to display in our house but we do have them of Caleb and several can be found around our house. 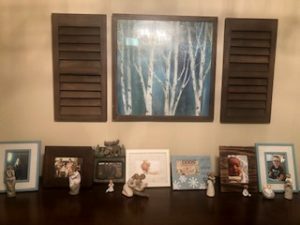 They are mixed in with pictures of our living children, of us and of our grandbaby because our babies that we carry in our hearts rather than our arms are just as much a part of our family as the rest of us. We don’t hide his photos; we display them with pride, just as we do with the rest of our children. We are proud of him; we are proud of them all. For us it’s just as natural to include his pictures in our home as it is anyone else. Our living children know about their heavenly siblings (well, the baby doesn’t quite yet!) and they are integrated into the fabric of our family. Have you ever looked around the pregnancy and infant loss community and thought to yourself- there’s a LOT of ink here! Our community is one of the most inked up out there and I absolutely love it because it speaks to beautiful scars. They are tangible, beautiful, memories of babies that are displayed for all to see – that is truly a beautiful scar! It creates conversations, opportunities to educate people about pregnancy and infant loss and also have something gorgeous to proudly display in honor of your baby. 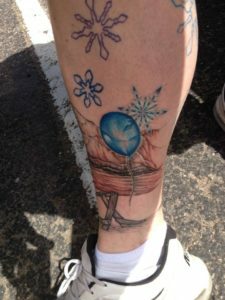 My husband has a massive leg sleeve tattoo with balloons for each of our babies, snowflakes that represent Caleb and the beautiful Grand Teton mountain range – our favorite place in the world. He also has Caleb’s footprints tattooed on his feet as a reminder that every step he takes in his life here, he takes one for Caleb as well. 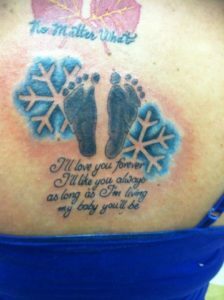 I have three tattoos for my babies- Caleb’s footprints along with the words to the book I used to read to him while pregnant with him. Four stars that represent each of my four heavenly babes and a white snowflake tattoo with Caleb’s name on it that is a reminder of my beautiful scars. I chose a white tattoo for that very reason – it looks like a scar. Tattoos aren’t for everyone but, for us, it is an outward expression of memories of four little people who have indelibly changed us, and created in us, beautiful scars. These six things are our touchstones; things we do to remember our babies that bring us comfort, have offered us healing and helped us to create our beautiful scars. Do they work for everyone? Surely not. But after many years of determining what worked for us and what didn’t, these are the things we have chosen to integrate our losses into our every day lives. They’re small things (well, Scott’s tattoo is pretty big!) however their meaning in our lives is too big to measure.